REYKJAVIK, May 22, 2011 (AFP) - The Grimsvoetn volcano under Iceland's largest glacier began erupting Saturday, the Icelandic Meteorological Office said, reporting a tall plume of smoke rising from the crater. AFP - A cloud of smoke and ash is seen over the Grimsvoetn volcano on Iceland on May 21, 2011. Another meteorologist at the same office, Fridjon Magnusson, told AFP less than two hours later that the column of smoke had swelled to reach an altitude of 20 kilometres. 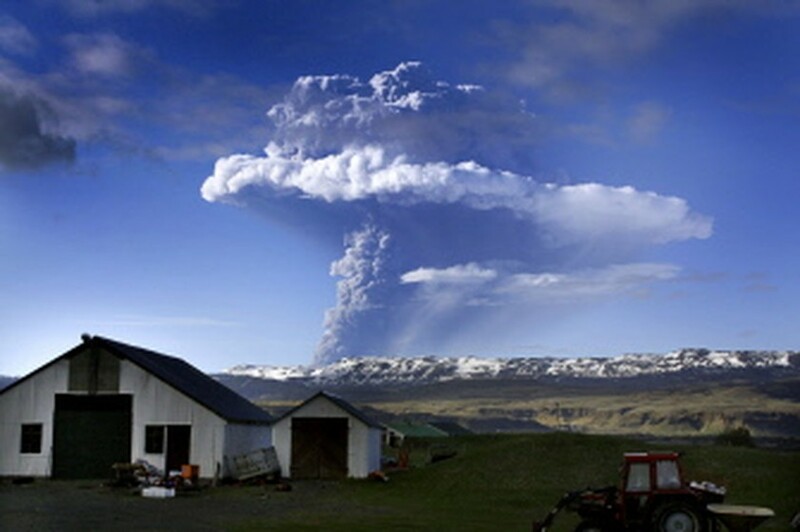 "The eruption has not yet spread very far, and is still looming over the Vatnajoekull glacier," Magnusson pointed out. "These are just the first few hours of the eruption. We can't say yet whether this will have an effect on air traffic like Eyjafjoell," he added. The problem with last year's eruption, which caused the planet's biggest air space shutdown since World War II, was according to the researchers that it happened under a glacier, bursting through 200-300 metres (yards) of ice. It was the "interaction between the cold water and the hot magma that made the particles really tiny," and therefore especially dangerous to aircraft, Susan Stipp, a professor at the Nano-Science Centre at the University of Copenhagen, told AFP late last month. "The (ash) particles were small so they went high and far. They were sharp, so they were a danger to airplane windows. It's like sand-blasting the airplane. And they were small and could melt at temperatures common in jet engines ... and could cause failure," she told AFP. While Saturday's eruption had sent smoke high in the sky, Magnusson pointed out that there so far was only "heavy ash at the bottom of the bloom (that) has not reached high heights." Bjarni Steinthorsson, a farmer who lives near the Vatnajoekull glacier, meanwhile told the Morgunbladid daily's website small amounts of ash had begun falling in the area and "the snow is getting darker." He said that he expected more ash to fall overnight, although what happened would depend on the direction of the winds, which were currently almost still at the eruption site. Iceland's State Road Authority meanwhile announced late Saturday it had temporarily closed a road near the glacier that is part of the national highway system. Grimsvoetn is also located under a glacier, in an enormous, eight-kilometre (five-mile) diameter caldera -- a collapsed volcanic crater -- near the centre of the Vatnajoekull icefield. When it last erupted in November 2004, volcanic ash fell as far away as mainland Europe and caused minor disruptions in flights to and from Iceland. Geologists had worried late last year the volcano was about to blow when they noticed a large river run caused by rapidly melting glacier ice. Eruptions at Grimsvoetn traditionally result in massive flooding, although this has little impact since the surrounding areas are uninhabited.